May 3, 2013 — My sweetheart (SH) and I started this last leg of our amazing winter motorcycle adventure like we have most of the others – with a 5:00 a.m. wait at the Metrodome Station for the light rail train to take us to the Minneapolis St. Paul airport. We arrived in St. Louis, MO, in a light rain and about 40 degrees. So much for the forecast, which was for much better weather! Our first stop was at Vom Fass St. Louis, in a charming shopping area of Maplewood. TomboyTam.com followers, you are among the first to learn that I’ve started a whole new adventure, in the form of franchise ownership of Vom Fass in the Twin Cities South Metro! We had a lovely visit with Luke in this store, and were sorry to miss meeting the owner. I got some great ideas from their store layout, classes and the info Luke shared. After breakfast at Tiffany’s – really! – we headed out on I-70 West to 79 North in cold rain. We stopped in Hannibal for the night, a much shorter day in terms of mileage than we had planned. I’ll share more later, but the photos will tell much of the story. March 31, 2013 – It’s a beautiful day in St. Louis! Clouds have given way to sun and it climbs to about 65 degrees today! We have a little time to explore before putting the bikes away for another month and returning home to Minneapolis. We sleep in until about 7:30 a.m., eat a light breakfast from the hotel’s complimentary offerings, and then hop on the bikes to go downtown. Our destination is the St. Louis Gateway Arch on the Mississippi Riverfront. I’ve seen the arch from a distance, the two times I’ve been to / through St. Louis, but I never knew that there is a tram system that take visitors up through the arch! In fact, I never knew that the arch was big enough to house a tram system inside! It was a fascinating experience. I also enjoyed the museum inside the visitor center while waiting for our turn in the tram. The Arch is a lot bigger than it looks from afar. Charles Barber is the guy who designed all the peace medals that the explorers gifted to and used to seal treaties with the Indians. Inside the tiny tram car. We left downtown St. Louis about 1:00 p.m., riding the bikes in brilliant sunshine and basking in the temps we wish we could have enjoyed yesterday. But today we rode to Public Storage to put them away for another month. We walked about 1/2 mile back to the Comfort Inn where we caught the hotel shuttle to the airport. Lunch at the airport, and a short and uneventful flight home ended this leg of the adventure. This was probably my favorite leg, from a road and scenery perspective. It was a little surreal today, realizing that the grand adventure my sweetheart (SH) and I dreamed up together is almost over. Some people go their whole lives without doing anything this adventurous! And here we are, already looking forward to the summer adventures and dreaming about what to create for next winter. Although we are both in the middle of career opportunities and changes, we are committed to maintaining our time together exploring and adventuring as a high priority. And time with our families and friends is also a high priority. I think we can balance it all in a way that feels right and good. Or at least have a great time trying! Hope you had a great Easter Sunday – as traditional or untraditional as felt right for you! March 30, 2013 – Awake at 6:00 a.m., on our bikes by 7:22 p.m. in 54 degrees and cloudy weather. Failing again to find a mom and pop breakfast joint in Mountain Home (well actually, we found one but they were closed today, to prepare all the bakery orders for Easter), we stopped at McDonald’s for a latte and WiFi. After traveling east on Hwy 62 a few miles, we stopped at Southfork Cafe in Salem AR, for the first real breakfast of the trip. I mean the kind where I can order the special of the day (2 eggs, country ham, hash browns and toast or biscuit for $6.95 (of course, I have to waive the bread for the meal to meet my gluten-free needs), and the server calls me darlin’ and you can almost hear the country song being written as she shares tidbits about her life. Such as “Between you and me, I went to culinary school and won the top prize in a baking competition at the school, and then I won fourth place in a state competition. . . My daughter asked me to bake a cake for a memorial service for a friend who was a trucker . . .” And now she appears to be the owner/operator of a nice breakfast/lunch/dinner joint in Salem, Arkansas. I bought two framed pieces that are on display by local artists for a total of $30. That’s the kind of mom and pop places we love to find! This one was worth the lack of them the past two mornings! Then on to Mammoth Springs, shortly after which we entered Missouri and near where we turned onto Hwy 9, then to MO state hwy 19 for much of the day — and take note bikers — it is a dream of a highway! Forest, lakes, mountains, curves, hills — miles and miles and more miles of ribbony two-lane highway along beautiful scenery. It’s even better than Scenic 7 yesterday! Towns along the way included Alton, Winona (gas), Eminence (home of Eminence Ozarker 4-H Club), Round Spring, and Salem, MO, where we stopped again at McD’s for another latte and WiFi break, but mostly to thaw out my numb finger. Renaud’s syndrome is a bummer when it comes to biking in chilly weather. And OK, I have officially been at McDonald’s more in the last 30 days than I have in the past 5 years! We continued North on 19. It started raining lightly at Cherryville, and by Steelville the rain began in earnest, so we stopped to put on our rain suits. It’s consistently 50 degrees most of the day, so the extra layers feel good. It’s chilly and the wet pavement slows us down, but we can’t complain since we’ve dodged rain 98% of the time on our travels for nearly four years! We pass Cuba, then stop at Owensville about 2:00 for lunch and to warm up. Then on to Hwy 50 East for 30 miles, Gerald, Bueafort and Union. Gerald appeared to be a very cute little down with lots of fun businesses. We travel interstate highways as little as possible on our travels, but there are times when it is unavoidable. 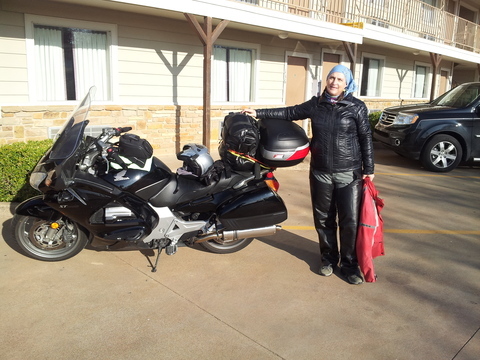 Today was one of those days – for time, convenience and given the cold, wet conditions, we got on I-44 for 35 miles to I-270 to the West end of St Louis, North to I-70 East, past airport to Comfort Inn. Freeway driving terrified me when I first started riding. As my skills improved and my experience developed, I was no longer terrified of freeway driving (or I wouldn’t have been able to manage the L.A. or Dallas freeways!) but they are still not fun, and given the wet conditions, my muscles were tight by the time we pulled into the Comfort Inn. My sweetheart is often thoughtful of my advanced beginner status, and left me at the front door with the bags after I slid off my bike into a puddle of weariness, while he parked both bikes. A hot shower, rest, glass of wine and nachos later, I’m feeling recovered, but still looking forward to a massage back at home next week! It was another incredible day, with a total of 302 miles – all of it beautiful, most of it fun, and the last of it, mentally and physically challenging. I’m always learning and growing, and these trips offer so much material for that growth. I learn geography, experience different ways of living, engage with and learn from people who live very different lives than mine. I learn the thrill of accomplishment and fun when I’m able to take curves comfortably without slowing way down, and I conquer fears of heights and freeways. I’ve learned how the sun, wind and freedom make creativity flow through my brain, when I though 18 years in Corporate America had rusted my creative circuitry. So, I’ll take a little rain and a few miles of freeway and be grateful for it! Wishing you, me and our families and friends a blessed Easter, as we marvel at the mysteries and miracles of life and death. Another beautiful, sunny, brisk Texas morning found us out for a walk in Tonja’s neighborhood before returning to a delicious breakfast of steel-cut oatmeal, brown rice farina, and yummy toppings, including blueberries and walnuts. After lingering over the kitchen island as long as we dared, we loaded up the bikes, said our good byes and headed south to Dallas to store our bikes until the next leg of our Winter Adventure. The Super Shuttle that my trip-planner extraordinaire and sweetheart (SH) had arranged showed up on time at 11:15 a.m. to take us to DFW for our flights home. SH made his flight arrangements before I did, as I was waiting to see how I could arrange my travel around work commitments, so we ended up on different airlines. I kissed him adieu at his ticket counter, and then took the airport shuttle to Terminal A where I settled in to wait for my American Airlines flight back to MSP. This chapter of our adventure draws to a close with nearly 800 miles over three days of travels on our bikes. If I count the flight miles from Minneapolis to L.A. and then to El Paso, we experienced well over 2,500 miles on this trip. Chilly temps, warm sunshine, traveling through parts of this beautiful country I’ve never seen before. Conversations with fascinating people, a glimpse into lives that are so much alike, yet so different from mine. I am truly grateful for a travel companion who I can spend 24 hours with for 7 straight days and still appreciate each other. I am blessed to have these opportunities, and am proud that we have found ways to explore economically in a way that allows real engagement with real people, not just passing through observing. I feel like I experience life more intensely in a few days in our travels than I have in some entire years of my life. How do you experience life with intensity? I’d love to hear your ideas and experiences for doing so. These upper 20-degree mornings aren’t conducive to early starts on the bike, but they are great for leisurely breakfasts and chats with the local folks. This morning was my favorite such breakfast at L&L Family Restaurant in Breckenridge, TX. As I walked inside, several older people were leaving, and a cute little old lady said to me, “Are yeew rahdin’ on the back a that man’s bahk this cold morning’?” I replied, “No ma’am, I’m riding my own bike!” That gave her just a moment of pause, and then she exclaimed, “ Well good for yeew!” I love these people! I often think about how blessed and grateful I am to have the opportunity to experience the people and places we come across during our travels. This man’s comments made me think about how our presence impacts those we interact with along the way, too. And perhaps our appreciation of the grand – and sometimes homely – beauty of people and environments help the local people see their surroundings and each other through the more appreciative eyes of passing strangers. It’s a relatively short drive into Dallas today, where we found our storage unit, and checked in. Dallas / Ft. Worth is a maze of construction and spaghetti freeways. I do not like driving my bike on freeways, especially when they are under construction and hundreds of feet up in the air! Thanks to our AWESOME Sema headsets, and my MARVELOUS sweetheart who does all the navigational planning, we got through the city driving without mishap. Only in Texas – oil pump in the back yard of the restaurant. Well maybe in ND too, now. After a quick salad at McDonald’s (I don’t remember how many years it’s been since I’ve eaten at McDonalds!) and taking advantage of their Wifi, we headed North to Prosper, TX, to visit and spend the night with our friend Tonja and her family. We enjoyed a wonderful evening of cooking, eating, wine, meeting the kids and fellowship! And I thoroughly enjoyed working the stress kinks of freeway driving out of my back with a soak in Tonja’s tub and a solid night’s sleep. After nearly a week of masterminding and biking, I’m ready for the flight home tomorrow! After a quick breakfast at the hotel in Hobbs, my sweetheart (SH) and I continued East on Hwy 180, starting the day dressed warmer than yesterday’s start, including the addition of chaps, a neck-warmer and my light down jacket under my armored jacket for me, and winter gloves and light jacket as a liner for my sweetheart. The sun is warm, but when we start out in the high 30-degree levels, the wind is chilly, even for these Minnesotans! We stopped in Lamesa at a Mexican family restaurant to warm up / snack / coffee break. Then we continued on Hwy 180, enjoying the changing landscape that includes desert, oil, hills, mountains, some trees, increasing agriculture and ranching – and long stretches with a whole lot of nothing! We always seem to find the beauty in our travels, even in the desolation of sparsely populated, remote areas that include long, pancake flat stretches of straight highway. Loving 75 mph posted speed limits. It’s a windy today, and the fields of windmills near Albany are good indicators that my arms will ache by the end of the day from balancing the bike against the gusty northwest breezes. Although it is the windiest little city, I love Albany, TX, population about 2,000! It appears to be a much more affluent town than Snyder or Lamesa. We had a latte at a very cute and historic drug store, shopped for souvenirs in a gift shop, where we chatted with a charming store clerk (who gave me a postage stamp for my postcard to SH’s Uncle Walter). Hmm, an airbase nearby Albany? Not sure I could have resisted these, had there been a pair in my size! We didn’t take the time to visit the Old Jailhouse Art Center, but the lady in the Chamber of Commerce was eager to tell us all about it. If I were to move to a small town in Texas, I would be likely to choose Albany! The Ridge Motel in Breckenridge, TX, is our stopping point for the night. I collapsed for a short nap, and was tempted to stay there all night, until my empty stomach convinced me to get up. We walked over to Ernie’s Spanish Kitchen for dinner, where SH had a burritto and I had a delicious rib-eye steak. It can be tricky finding gluten-free food in the boonies. The servers often look at me like I’m speaking Chinese when I ask whether a dish is gluten-free! I usually stick to eggs, salads and grilled meats, for the most part, on our travels. The server was an energetic, sincere woman who must have had close to the same circumference and height measurements. The people in outstate Texas have been just delightful, hospitable, and interesting. After our second 250-mile plus day in chilly, windy temps, I think I was sleeping before my head hit the pillow. Tomorrow will find us back in the city.